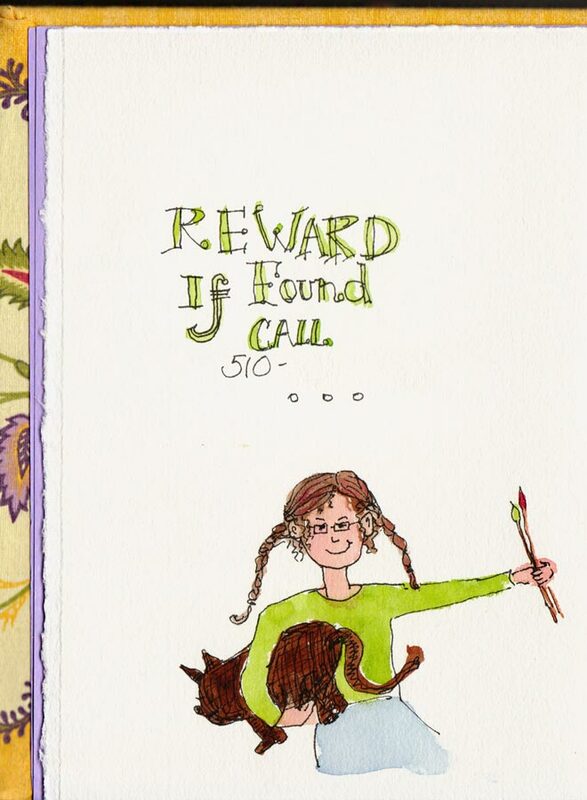 Along with an end of journal self-portrait, I always put an “If Found” notice and silly self-portrait at the beginning of each book (phone number erased for privacy). I started doodling something I was carrying under my arm that turned into a very fat cat (or is it a pig?) And yes, I do wear Pippi braids and bright green shirts sometimes. Above is my new journal, covered in a piece of cloth cut from an old tablecloth, stacked on top of the last journal, now complete. I temporarily added the silly butterfly sticker as a reminder of what I intended as the front and bottom of the book. And then in my usual Jana way, I accidentally ignored it and started sketching from the opposite direction. And it doesn’t make a bit of difference. 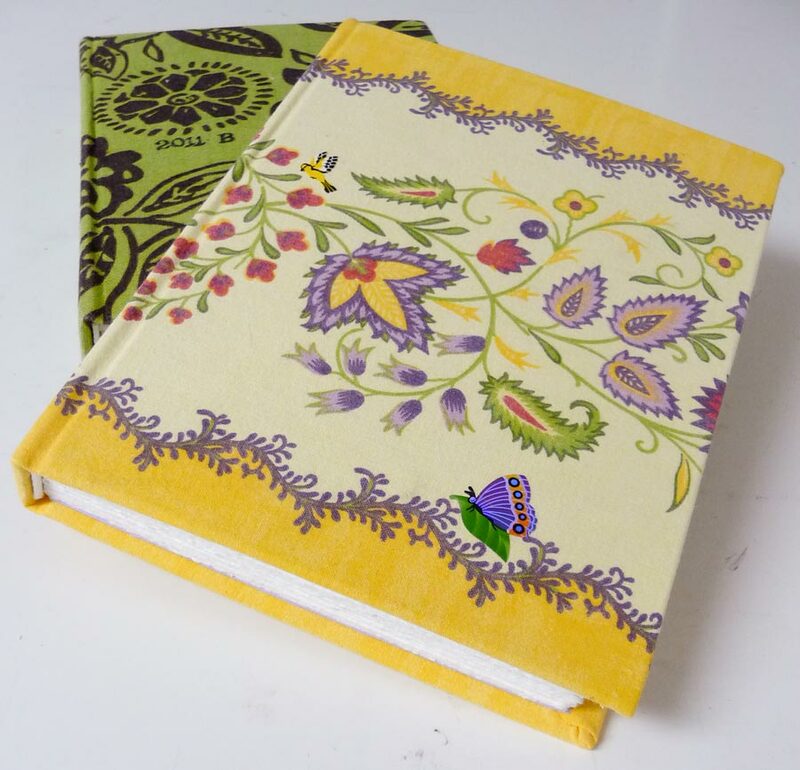 Even though I’ve gotten the binding process down to a 6-hour project per book (when done one at a time; haven’t tried batching them yet), I was looking for a way to save time and be able to sketch without having to bind my own journals. I have yet to find a store-bought journal I like as much as my own, so I wasn’t considering that option. I came up with the idea of using an aluminum form holder filled with individual sheets that I could later put in an inexpensive art presentation binder in order, as if in a journal. I liked the idea I could keep different types of paper in the holder and set it up to use with my little watercolor kit. While I like this nifty system, and have used it a few times, it just felt weird not carrying a journal containing a little history of what I’ve been seeing, doing and thinking (I don’t share the “thinking” pages here). So now I’m doing both, always carrying the journal above, and when I want a variety of paper, individual sheets, and/or a convenient surface for sketching and painting, I also bring the lightweight Form Holder. Mine is a small size, but a larger one might be really super as a laptop desk. Above is another nifty tool I had made at my neighborhood Tap Plastics for about $3.00: a little template made of very thin plastic with rounded corners that I trace around with a pencil to pre-draw borders on my journal pages. It helps me to have a window to draw within (which I sometimes ignore or erase if I want to work across the spread). Once I finish a sketch I go over the pencil line with black ink. 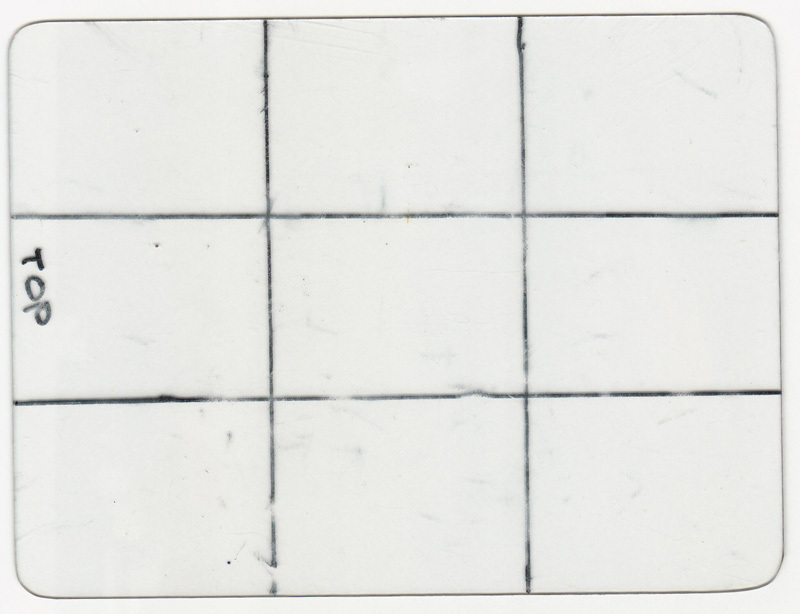 I drew the black lines on the template with a wet-erase marker so it can also be used as a viewer to see how and where what I’m looking at “should” fit in the drawing (though I rarely use it for that). I neither know why, again in typical spatially challenged Jana fashion, I wrote “Top” on the template (why would it matter? ), and even more perplexing, why I wrote “Top” at the bottom of the template. But it makes me laugh when I see it so I haven’t wet-erased it. In my google feed reader, you come right after Janet Reid (although one would think you’d come before– google’s not great at alphabetizing, obviously.) Anyway, I thought this had been written by Janet Reid (who is a somewhat ferocious literary agent, very quick and smart) and as I read it, I thought, “OMG! Janet Reid can draw! She loves paper. She’s so smart about the physical book and about watercolor. Oh, how I loved knowing that she does this, although honestly I was quite surprised, because that kind of fluency and ease around these subjects didn’t seem like her at all. And then I realized this was YOU and although I felt a little sorry for Janet Reid (who doesn’t need my compassion in the least, because she seems like a person who’s enjoying the hell out of her life), it made me laugh and made me remember that no one could ever do what you do. And I’m lucky to have found you. Happy Birthday Jana! And I got a kick out of how you dutifully labeled your sketch template. We just have to chuckle at ourselves. I do something with what’s known as “Beth logic” fairly often . For example, our very nice plastic recycling container has suffered a premature expiration…because I had a tense day at work, and so after coming home I decided to bash the container to pieces against the dumpster. it made sense at the time. Now, why didn’t I just take a 10 minute walk? Oh well!! One of the contributing artists did an unbound book that she later wrapped with the most beautiful cloth and not too fussy ribbon. I got to see it in person and loved it. And I really like your idea of the un-sketchbook and the sketchbook. Love your blog! It encourages me to find out you are also spatially challenged as I see it hasn’t interfered with your painting! Thank you for sharing this, I just love peeking into people’s sketchbooks like this! Your self portrait is adorable! Could you have written TOP on the side you used the pen so it wouldn’t rub against your paper since you would always know it was the TOPside of the template rather than the top edge? You gave a puzzle so I am trying to solve it, lol. Your book is lovely and I like the butterfly on it. I end up doing at least one page upside down in each journal, not on purpose; it just happens. I love your way of asking for the book to be returned if lost.